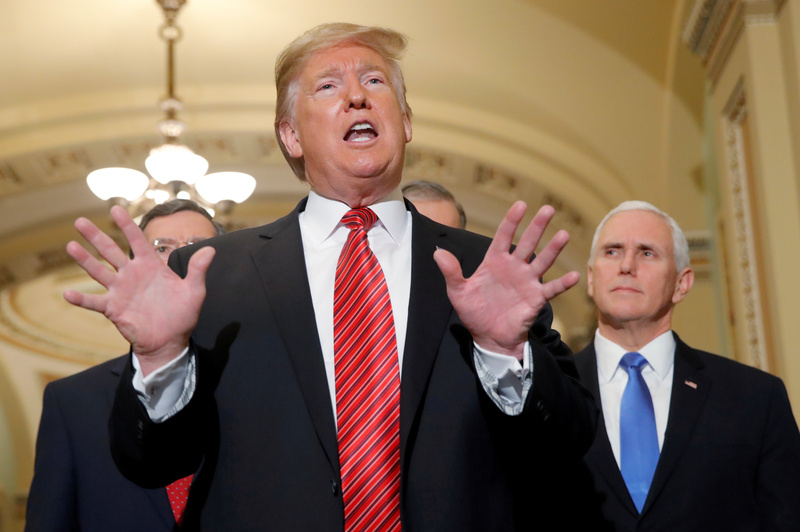 House Speaker Nancy Pelosi and congressional Democrats are losing one big voice in their opposition to President Donald Trump’s push for a border wall: The Washington Post’s editorial board. WaPo noted in a Sunday editorial reasons why Pelosi should rebuke the president’s most recent offer to temporarily extend protections for the so-called Dreamers. But the paper eventually explained that taking the deal would ultimately help those who came here through the Deferred Action for Childhood Arrivals (DACA) program. WaPo’s editorial board has criticized Trump in the past for what its writers call pushing immigration policies that would “cripple the economy.” It’s taking a different approach now. Sunday’s editorial explains why young people who came to the U.S. through the Obama-era program are in peril of being deported. If nothing happens soon, then the Dreamers could get the short end of the stick, WaPo noted. U.S. President Donald Trump talks to reporters as Vice President Mike Pence looks on as the president departs after addressing a closed Senate Republican policy lunch Washington, U.S., January 9, 2019. REUTERS/Jim Young. Pelosi was not impressed. She preemptively shot down the proposal in a statement before the president’s announcement.